I’ve become obsessed with keeping the exact location of the best blackberry bush in the whole of Shipley a secret, even going to the trouble of deleting the geotags from a photo I took of the view when I was stood right next to it. I swore the kids to absolute secrecy. There are blackberries everywhere around here – the ones lining the canal are OK, better towards Bingley than Leeds, but they’re in plain sight and quickly stripped bare by passers-by. Those berries are smaller, and tend to suffer a light coat of dust from the towpath. There are other spots around and about, but the secret one me and the kids use is the best one, on a shallow slope overlooking the valley and it’s mills and houses, with bushes just hidden down a sudden steep part, away from the path, steep enough to dissuade people who don’t really want to get some fruit. The bushes are left largely undisturbed, and the fruit is big, sweet … perfect little bombs of flavour, just hidden away. We gathered about four kilos this year, in the peace and the quiet, the grass damp from a shower, the jet black fruit glistening in the humid air. There were the usual scratches, nettle stings, and assorted injuries that go along with any foraging expedition, especially one centred around a frankly quite aggressive plant. Nothing this year that needed hospital treatment, though. Picking blackberries is a type of combat – it’s you against the plant, and the plant has the upper hand, mainly because it has spikes, and likes to use them. Later, some of the blackberries went into a couple of crostada di more, an Italian blackberry tart that buries the fruit in a deep layer of frangipane, and more went into a blackberry and apple crumble, just because, well, it’d be rude not to, really. A couple of kilos ended up in the freezer, and the rest were dispatched in this blackberry and apple jelly. 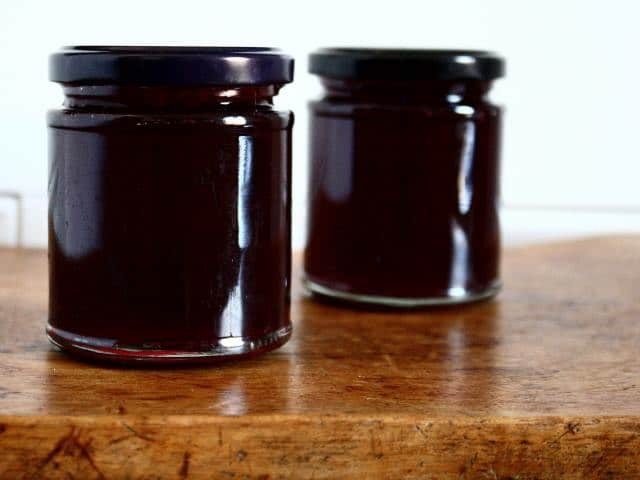 Up until now, I’ve always just made a normal blackberry jam, and chucked a few apples in for good measure. It’s been good, but I’ve got a peculiar liking for the crunchiness of the blackberry’s seeds in a jam that isn’t shared by many others … this jelly keeps the taste, but ditches the pips. Everybody should be happy. Preparation is ridiculously straightforward – a kilo of blackberries, washed and picked over, a kilo of crab or cooking apples, roughly chopped, peel, cores and all, and 1.2 litres of water go into a big pan over a medium flame. Let the fruit boil until it’s soft and mushy. Don’t be tempted to prepare the apples at all – the peel and core are packed with pectin, so just chop them up, get them in the pan, and let them do their business. The prize of the exercise is the juice. To separate it from the mushy fruit, line a large bowl with a piece of muslin, tip the contents of the pan into the muslin and draw the edges together to form a pouch that you can then lift out of the bowl and hang over it. There may need to be a little ingenuity here – I found an old steel bar, rested it across two chairs, and tied the bag of fruit to that. The idea is to let gravity separate the liquid for you, and that takes a good few hours to do – overnight is best There should be anything up to about 1.5 litres of juice to finish with. The next morning, start to heat the blackberry and apple juice in a large jam pan, and add 450g of sugar per 600 ml of juice, stirring to help the sugar dissolve, before cranking up the firepower to the top to get the jam boiling hard. Hold that rolling boil for about ten minutes, then test for setting by dribbling a little of the jam onto a cold plate and refrigerating it for a minute … the jam will crinkle when pushed and prodded if it’s reached setting point. Spoon the finished jelly into sterilised jars, tighten the lids, sit back and relax. This jelly is excellent spread thinly on toast. , one of those little River Cottage Handbook books. Just as the rest of the series, this one is a superb introduction to the subject, and a tenner well spent if you’re thinking about starting to make jams, preserves, chutneys and the like.